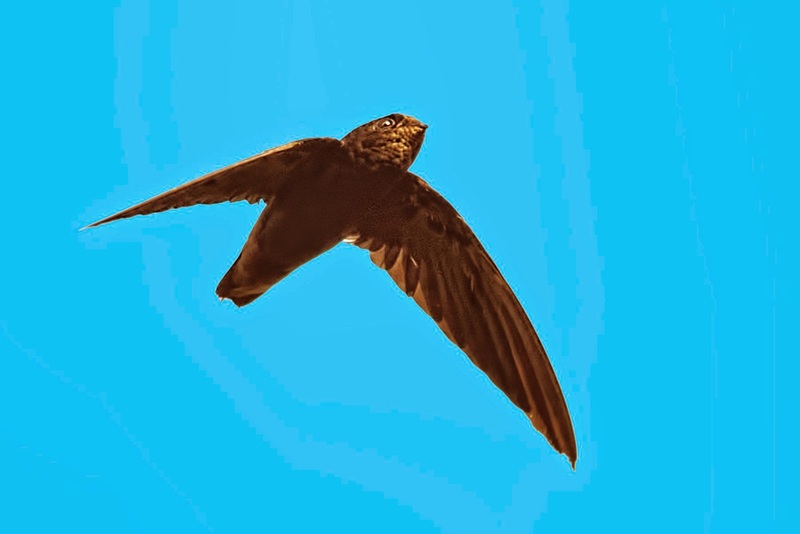 Osvaldo Quintero also sent in this photo of a swift taken over his house in Panama City last year. I'd call it a Cypseloides, probably Black Swift (which is very rare in the Canal Area), but as always we eagerly await your comments. What do you think? I think it may be a White-fronted Swift Cypseloides storeri, usually thought to be endemic to Mexico. It looks short-winged and short-tailed for Black Swift and seems to be more brown than black, all of which are features of storeri. Furthermore, it has whitish postocular feathers, which distinguish storeri from the similarly short-winged and short-tailed cryptus (according to the scientific description of this species that is relatively new to science: Navarro, A. G.; Peterson, A. T.; Escalante, B. P.; Benítez, H. 1992. Cypseloides storeri, a new species of swift from Mexico. Wilson Bulletin 104: 55-64).